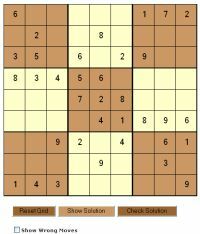 Puzzles offer fun and engaging content for websites. Gone are the days where people are happy just with flat information based content - with the proliferation of interactive content across the internet it can seem hard to keep up, but puzzle feeds offer an immediate way to include this sort of popular content. We have a range of puzzle feeds available, including a mix of logic and number puzzles including the ever popular sudoku feed. One of the elements that makes our puzzle feeds so good for business websites is that it enables you to differentiate from all other websites, because our feeds are all bespoke - you receive new puzzles that are not available on any other website. We also can theme content to fit your site content, so the sudoku puzzles and look-and-feel on any given site will be tailored and specific to that site. Other puzzles available include our crossword feed of quick crossword puzzles. Crosswords are a popular and enduring puzzle, and are ever present in most newspapers and magazines for a reason - they are popular, and people take the time to fill them in. Therefore you can immediately have this benefit of engaging content that your site readers will come back to with our crossword puzzle feed. Additionally, puzzle feeds can be integrated more widely with other elements of your site: for instance if you wish to create a competition around a puzzle that appears on your site, then we can arrange for a suitable form to be created capturing the information you require about your readers and then sent onto you for you to process and pick a winner accordingly as per your competition rules. We can even create microsites containing a range of different puzzles, and can even target particular age groups, so if your website is targetted at the children's market, for example, then we can provide puzzle feeds at a suitable difficulty level. If you require a puzzle feed for your business website, then please Contact Us with details of your requirements.